How much electricity is used and the percentage of solar electricity to be generated. Type of PV material used (crystalline silicon or thin-film). Roof or other PV material mounting surface orientation, tilt, area, and condition. Local solar resource (solar radiation) and peak (direct) hours of sunlight. You or a system installer can review your utility bills to determine how much electricity you use–typically shown in kilowatt-hours (kWh). If the information is not on your bill, contact your electricity provider and ask for your average monthly use in kWh. Determine your average monthly electricity use in kWh. Divide by 30 for average use per day. Find the Peak Sun Hours for your location on the map. Peak sun hours are the hours of direct sunlight that fall on a PV panel (not total hours of daylight). Divide the answer calculated in #2 by your Peak Sun Hours. The answer is a rough estimate of the solar electric system size you will need (in kW) for 100% of your electricity. A Helena home’s monthly average electricity use is 856 kWh/month. 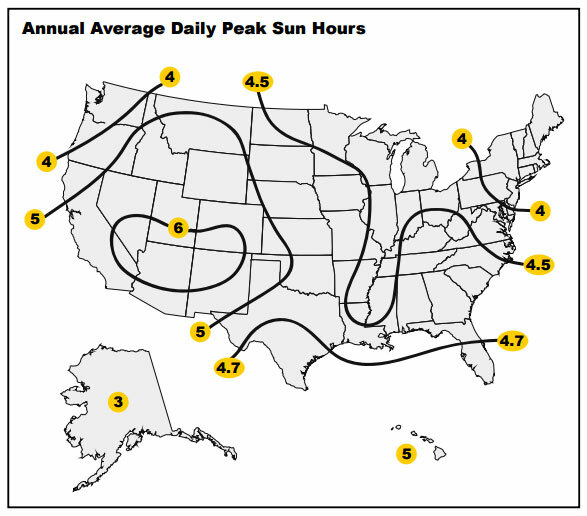 Helena is near the diagram’s “5” line = 5 annual average peak sun hours per day. 28.5 ÷ 5 = 5.7 kW PV system would be needed to produce 100 percent of this home’s electricity. NOTE: This method provides a rough estimate and should not be used to size a system. The actual system will most likely be larger due to many system-related factors. For more accurate sizing, use the worksheet below. It takes conservation and efficiency measures and system component inefficiencies into account. Montana homes used an average of 856 kWh/month of electricity in 2009. 365 days/year divided by 12 months = 30 average days in one month. Energy conservation and efficiency measures can reduce the size of your system. PV panels can be added to a system over time. The solar radiation value used to rate panels is 1 kW/m2 and thus the results are in watts. The amount of PV-produced electricity decreases as it flows through wires, the inverter, and other system components. NREL’s PV Watts on-line tool addresses this using a de-rate factor. Converts watts back to kilowatts (the units used to describe a system’s “size”). If you know what PV panel you will use, divide Box 7’s watts by the Peak Power (in watts) of the panel to determine the # of panels needed. Do you have enough space on your roof? Computer/On-Line Sizing Tools allow you to consider a combination of PV system options for specific locations using your address or zip code. 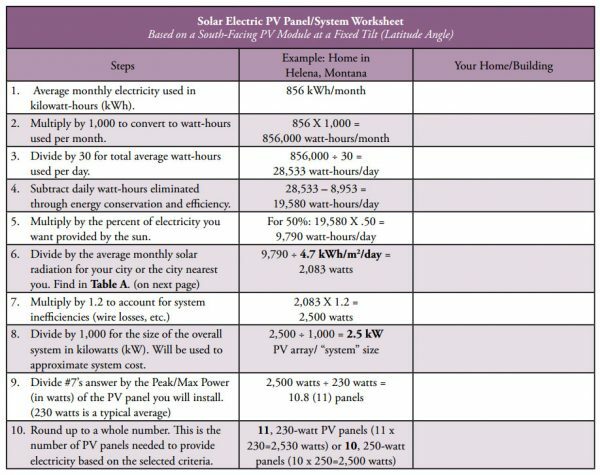 Know how much electricity you use in one year (in kWh) and the approximate PV system size you are considering before you access the free programs described below. NOTE: After you type-in your zip code and select “Send to PVWatts,” a screen will appear that allows you to make selections. Under PV System Specifications, “DC Rating,” change the default (set at 4.0) to 1.0. After you select “Calculate,” two tables appear. Under the “Results” table, look for the “Year” result (in kWh) under the “AC Energy” column. Divide your yearly electricity use (in kWh) by the “Year” number from the “AC Energy” column to determine the PV system size needed to provide 100% of your electricity from the sun. The “Energy Value” column shows electricity cost savings. Whether you use pencil and paper or a computer, these exercises provide a sense of what system size will work for you. A consultant or installer can provide a more detailed analysis and can advise on what will work best for your particular needs. Are you interested in solar electricity because you want to reduce your environmental footprint? To determine the amount of greenhouse gases you are not emitting into the atmosphere by installing a solar electric system, use Option 1 (insert the kWh provided by the solar electric system) with the U.S. EPA’s Greenhouse Calculator.